In the world's temperate regions, proximity to roads usually reduces the reproductive success of birds, thanks to predators that gravitate toward habitat edges. However, the factors affecting bird nest success are much less studied in the tropics—so does this pattern hold true? New research published in The Condor: Ornithological Applications shows that interactions between roads, nesting birds, and their predators may unfold differently in Southeast Asia. 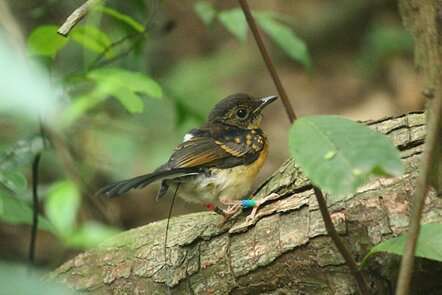 Rongrong Angkaew of King Mongkut's University of Technology Thonburi and her colleagues placed 100 next boxes for the cavity-nesting White-rumped Shama in forest interior and 100 near a road at an environmental research station in northeast Thailand. Monitoring nests and radio-tracking 25 fledglings from each site for seven weeks, they found that nest success was 12% higher and post-fledging survival 24% higher at the edge versus the interior—the opposite of the pattern commonly observed in temperate regions. "There were some special challenges involved in carrying out the field work," says Angkaew. "When we started setting up the nest boxes in the field, we found a lot of tracks and other signs of poachers and illegal hunting, so we had to avoid some parts of the forest edge in order to reduce human disturbance to our nest boxes, which could have affected nestling and fledgling survival rates." Overall, the study's results suggest that the effects of roads on birds' reproductive success depend on local predator ecology—the same rules don't necessarily apply in different biomes. Angkaew and her coauthors hope that more studies like theirs will help identify key nest predators and assess their foraging behaviors in multiple landscapes, in order to determine the best ways to conserve vulnerable bird species in areas affected by human development.